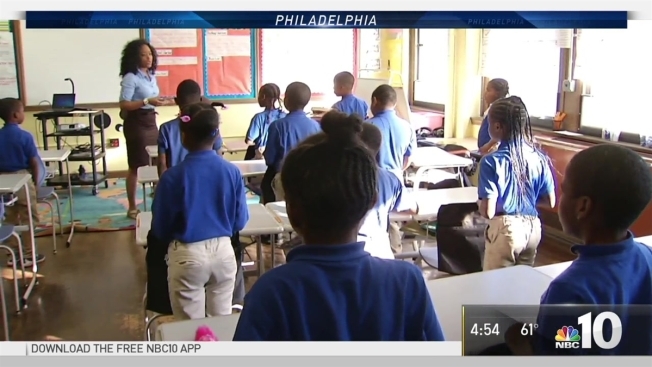 A North Philadelphia teacher's motivational message telling her students to "push through" tough situations to excel has gone viral online, earning her a trip to the "Today" show. Jasmyn Wright, a third grade teacher at Frederick Douglass Mastery Charter School, starts every single class with a call-and-response mantra she performs with her students. On Nov. 9, following the presidential election, Wright said some of her students were feeling discouraged and overwhelmed. In an effort to comfort them, she recited a self-affirmation chant with her class remind them that they can achieve anything as long as they’re persistent. Wright recorded the mantra, and uploaded a video on her Facebook page where it quickly took off. “What if it’s too hard?” She asks in the video. “I’m gonna push through!” The kids shout. “What if it’s too rough?” Wright questions. “I’m gonna push through!” They reaffirm. “What if you’re confused?” Wright asks. “I’m gonna push through!” They answer. Although she hopes the message galvanized her students, Wright found it unexpected for scores of people to feel inspired as well. “Thank you for teaching, thank you for sharing, and thank you for reminding me that we can push through,” said one of the Facebook users who have racked up at least 3.4 million views on the video. It has been shared more than 48,000 times. Just over a week later, Wright was coaching Savannah Guthrie, Matt Lauer and Carson Daly how to push through their challenges. "You're awesome," Guthrie said, giving Wright a hug, before the teacher told Lauer that her biggest inspiration was her mother. Ultimately, Wright wants her students to never doubt themselves.